Still in Utah | how's it going, eh? 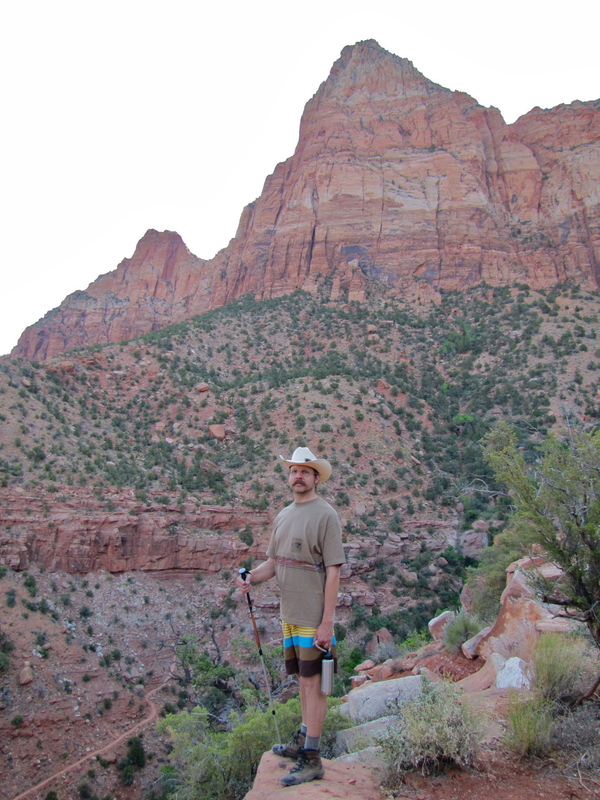 This morning we got up at 5:30am to get an early start on Zion National Park. We’ve been logging about 5 hours of sleep every night for the past 5 days. We’re running on fumes to say the least. First hike of the day we ventured out to The Watchman Trail. 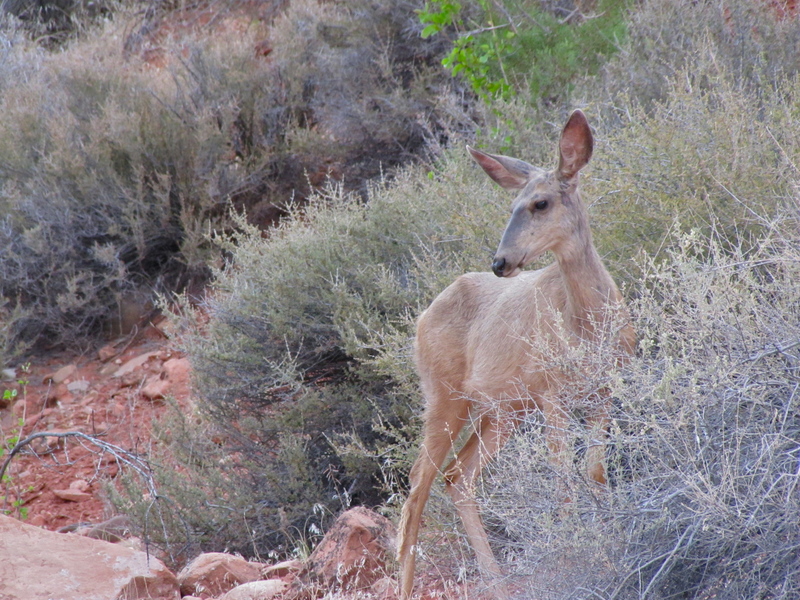 Oh hello Miss Mule Deer!!! Aaaack!!!! Baby popped out of nowhere! 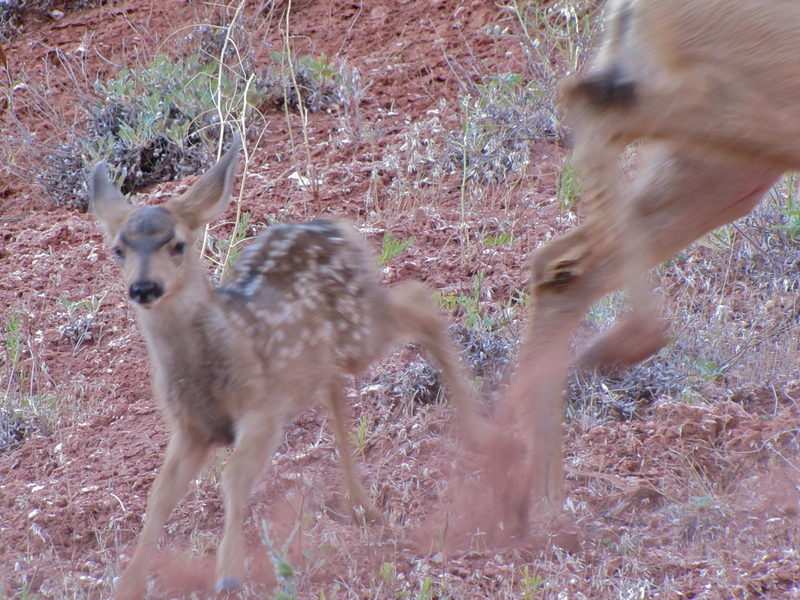 I managed to at least take a blurry photo of ultimate cuteness. 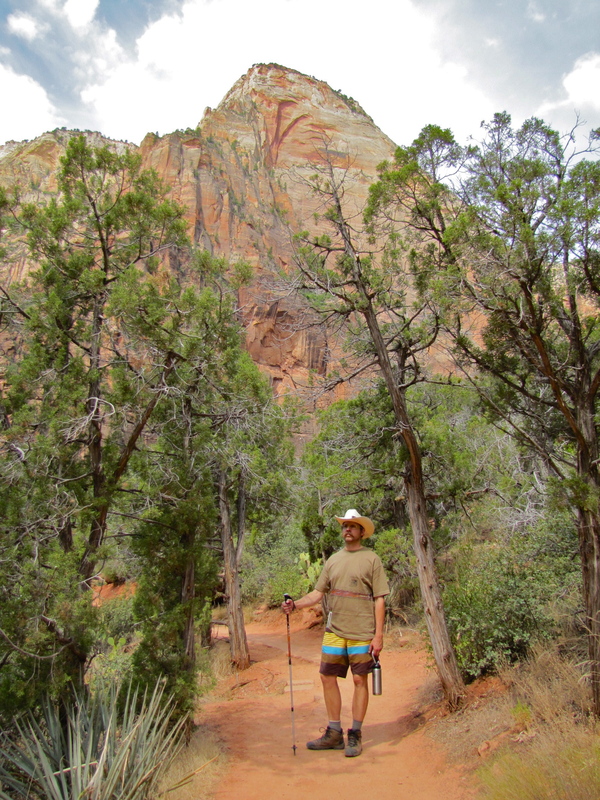 The Watchman Trail is a gradual uphill – we were really grateful that we weren’t doing this hike mid-day! Super beautiful early morning view of the mountains. We had to skedaddle our way down the hill to have time to make our way around the rest of the park. 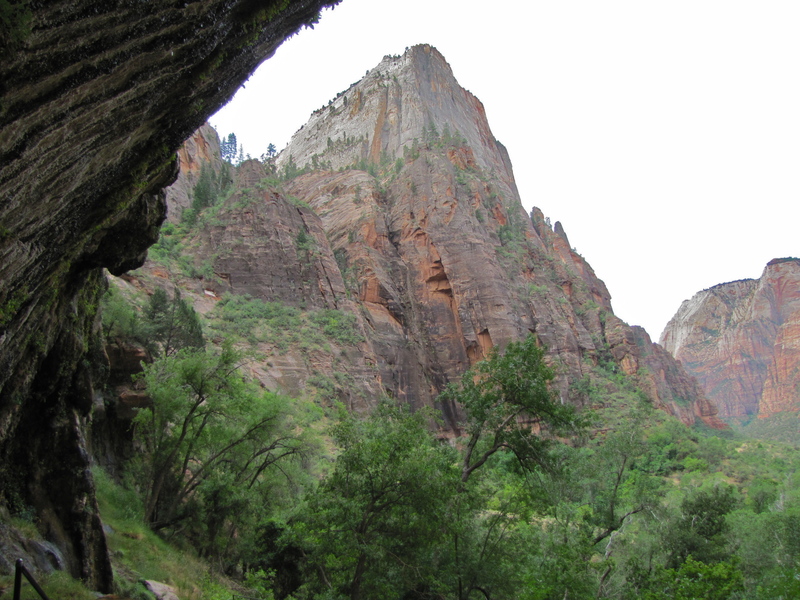 You know what is so amazing about Zion National Park? I’ll tell you what! It’s the bus system they have within park grounds! There was so much traffic + pollution within the park previously, so the park created the bus system which is completely genius. There are shuttle drop off/pick up spots where buses come by every 5 minutes! 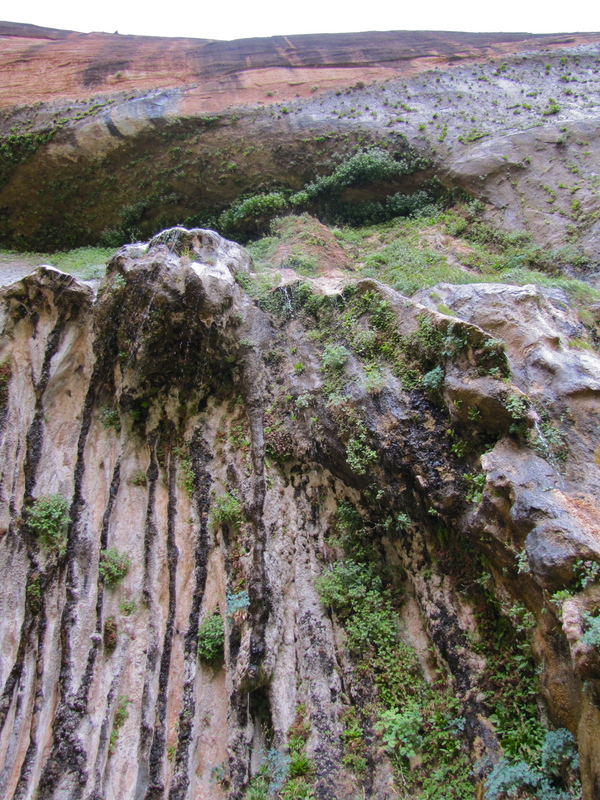 Our next hike was a short uphill hike to the Weeping Rock. Onwards back on the bus to head for the upper Emerald Pools. 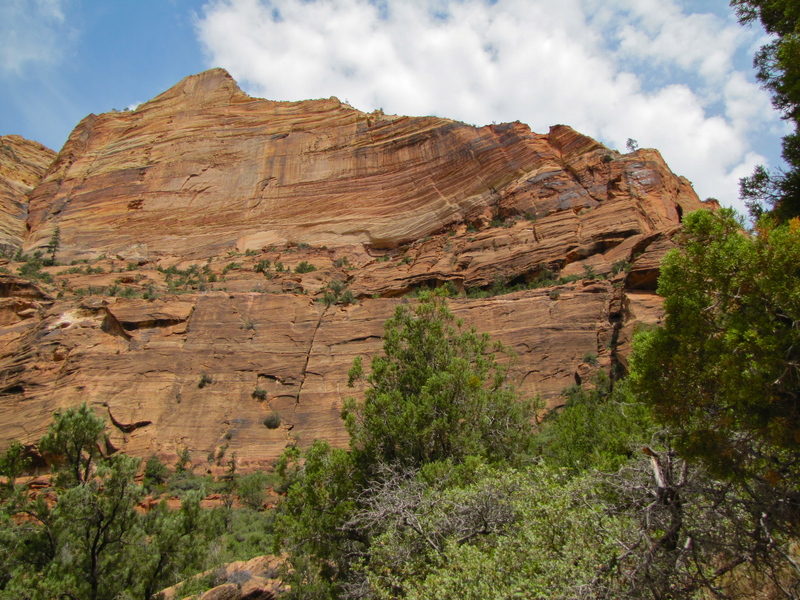 Look at the stripes in the mountain – apparently it is evidence of many layers of ancient sand dunes. View of the Virgin River. 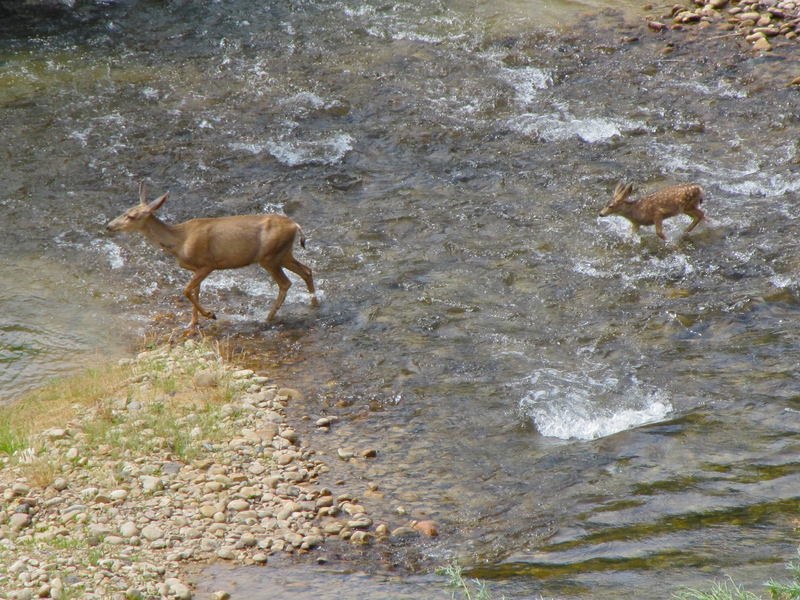 Zoom in from above of a doe + her bebe crossing the river!!!! Cuuuuute!!! Jeff in a juniper grove. 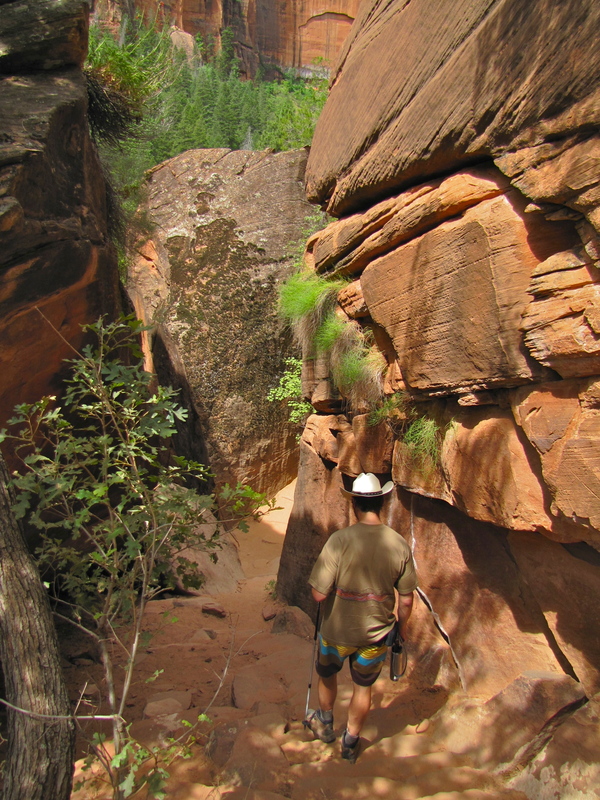 Descending into the Emerald Pools. 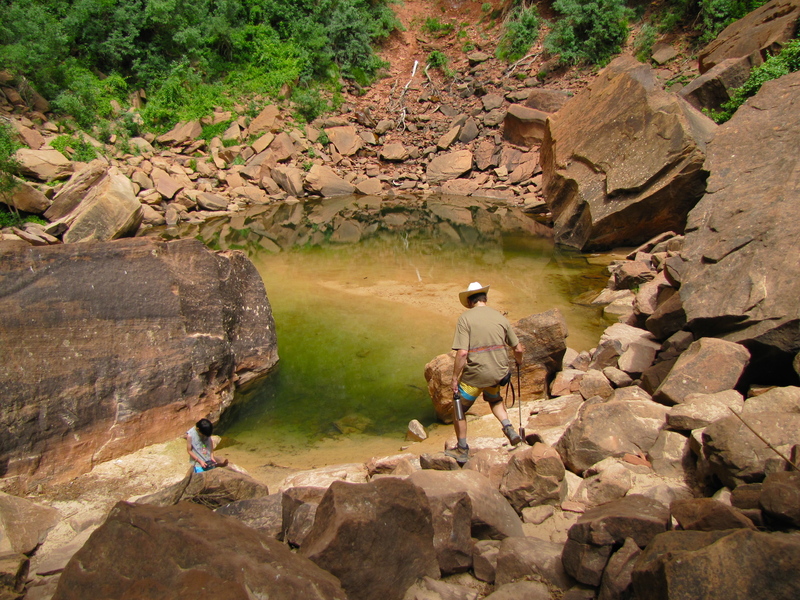 The green of the Emerald Pools are created by algae growing in their depths. Up above, there was more weeping to be had from within the rocks. 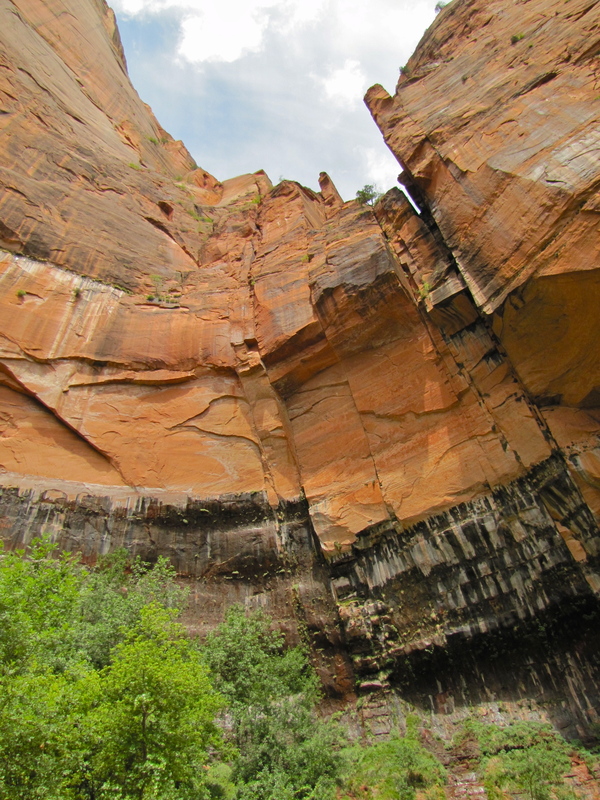 We ate our pack lunch at Emerald Pool, surrounded by savage, stalking scavenger squirrels. Then, it was time to head down. At this point it was around 1pm – don’t head UP any mountains at this point. The sun is way too darned scorching. It’s a cooker. 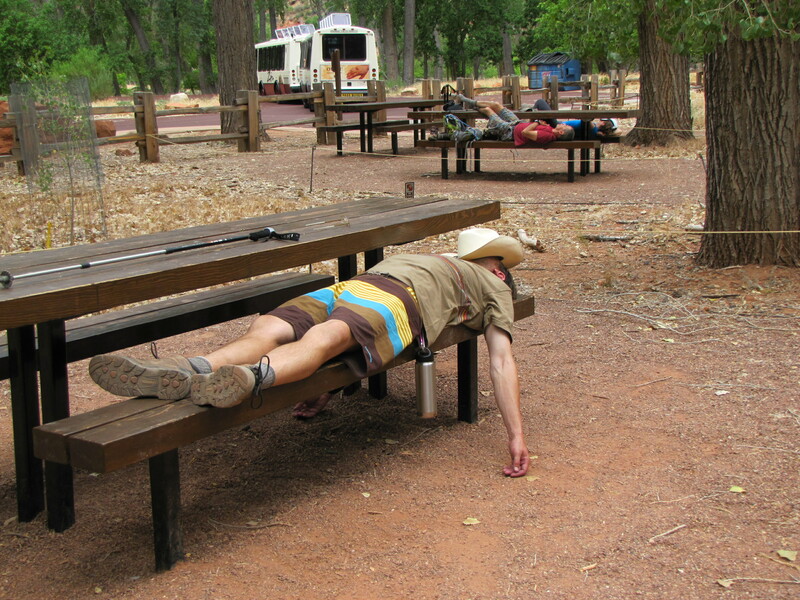 Once we made our way down I went to the ladies room + found a bunch of unconscious bodies laying about. Good lord!!!! Well, after 3 uphill hikes in 5 hours my calves were burning. 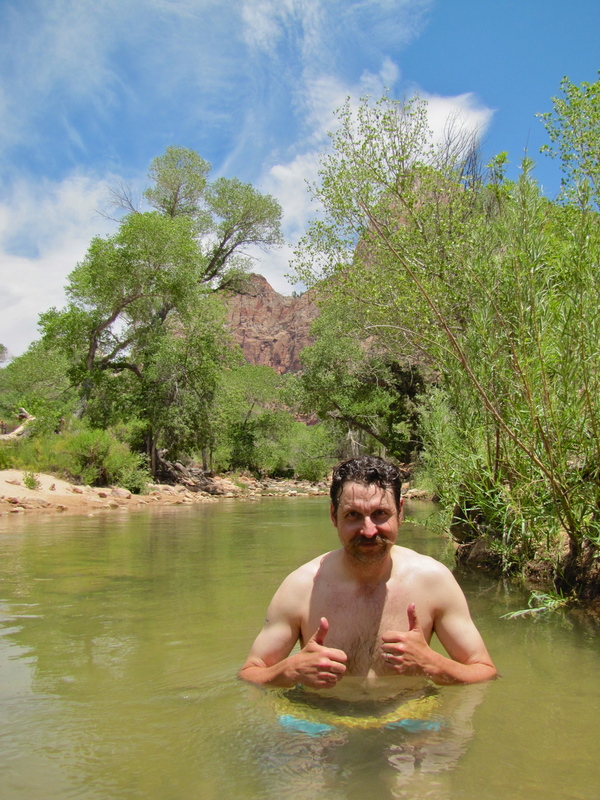 We walked back to the visitor’s center + Jeff had been dying to take a jump in the river. Oh man, that water was COLD!!!! So refreshing after tht burning hike! 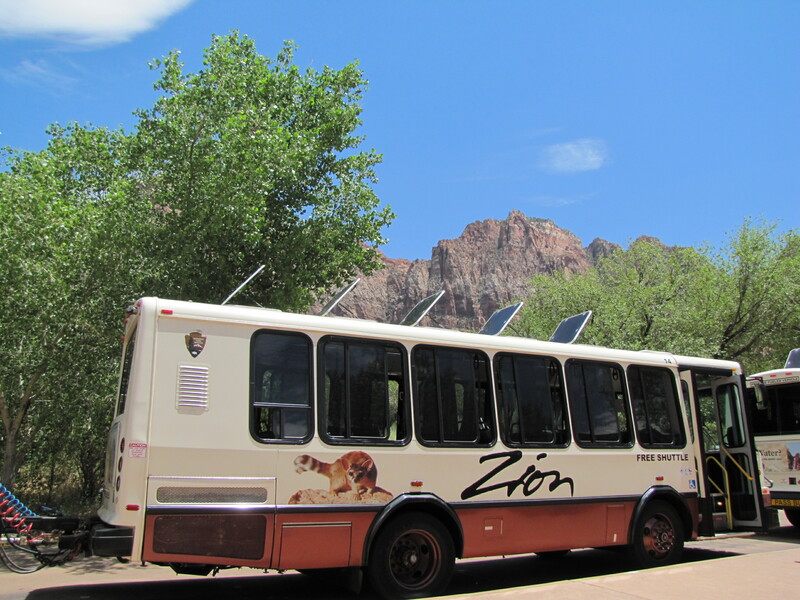 We left Zion + drove the 5 hours to forgettable Ogden, Utah Super 8. Glamor!!!! On our drive we saw a good billboard on a support group for leaving polygamist communities. Oh, Utah…. It’s off to the Land of Nod! Wyoming awaits tomorrow! 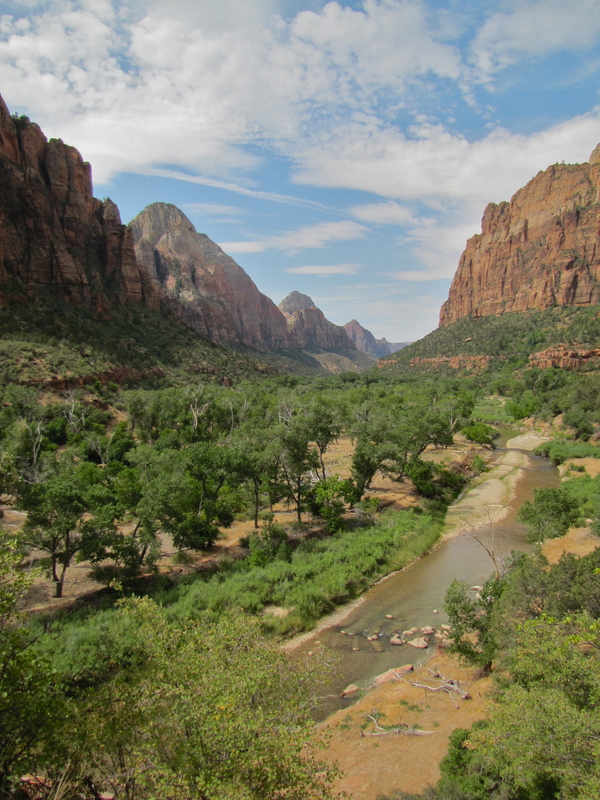 When I was in Zion, I liked to imagine what it must have been like for the early Mormon settlers who first came across that place. 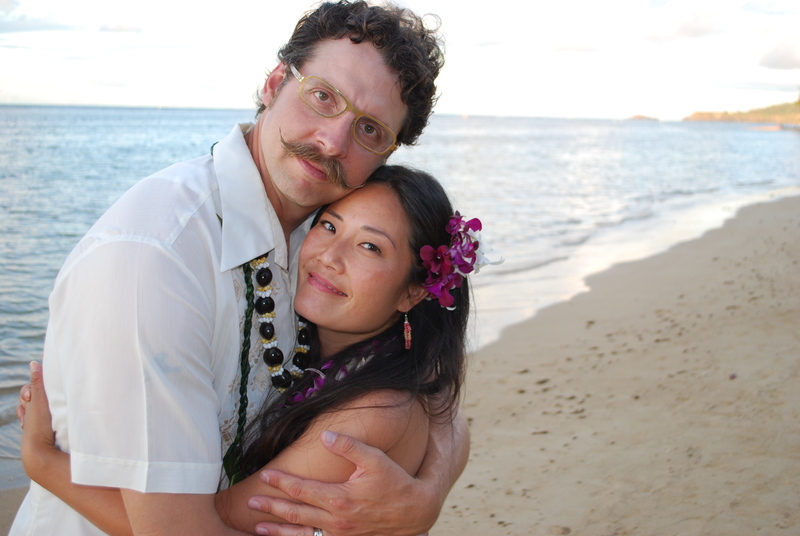 It must have completely blown their minds after traveling from upstate NY -> through the Midwest! That’s so funny, we’re such nerds – I was thinking along the same lines too when I was there!!!! It is a trippy, beautiful place! photo’s with it’s tele-photo len’s, HUH !!!??!!! very nice!!!!! she not realize i’m her keeper now & feed her li’l stomach,..